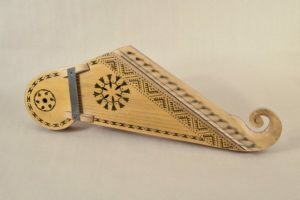 The kankles (Lithuanian stringed musical instrument) of proancient origin were developed before the Iron Age. Kankles were mentioned in 1546 accounts by the yard exchequer manager of Duke Zygimantas Augustas. The name kankles is derived from Lihuanian word clapper (wooden clapper). 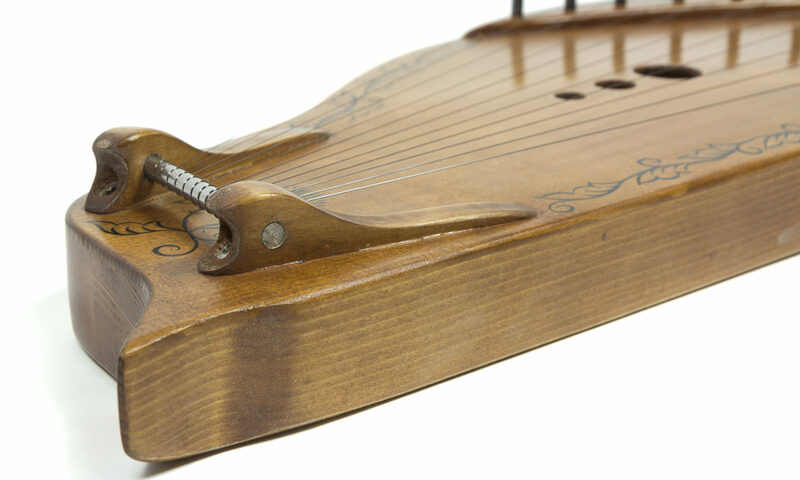 The name kankles and the instrument was widely known long before the metal age. That means that the word kankles goes as far back as the parent language of the Balts. Some scientists associate the name with the Latin word centare, and from Sanscript – konkani (an adornment with the bells). The legends tell us that long long ago senior priests (in pagan Lithuania) played on the kankles at ceremonies glorifying the war marches of the Lithuanians, making sacrifices for the Gods, fulfilling worship duties. The music of kankles was held to have the power to protect from various evils and to defend one from death. The kankles music was played at the wedding and christening parties, at harvest feasts and at funerals. After Lithuania was baptized, kankles remained only as a musical instrument. At the end of the 19th century with the development of the national movement, the rebirth of kankles began. Kankles were populiarised by various means. Song concerts, accompanied by kankles, were organised. In 1925 the association of kankles musicians was founded. In 1930 a school of kankles music was established. Most of the kankles where 50-58 centimetres in length, the width was 20-29 centimetres and their thickness was about 5-6 centimetres. They had 3-25 strings. In ancient times five-stringed, six-stringed and twelve-stringed kankles were usually played. Multispringed kankles are of a later origin. K ankles of 7 strings were considered primary, kankles of 8-12 strings were called ordinary and kankles of 13-25 strings were called complicated. The length of the strings depends upon the length of the body of the instrument. The longest string is 56,5 centimetres, the average string is 42-55 centimetres and the shortest string is 20 centimetres. Previous PostPrevious Musical instrument you can easily learn and play.